I’m very excited to announce my first ever blog tour! It’s called #SeriousWriters and will discuss the lifestyles, advice, and opinions of people who are serious about writing. 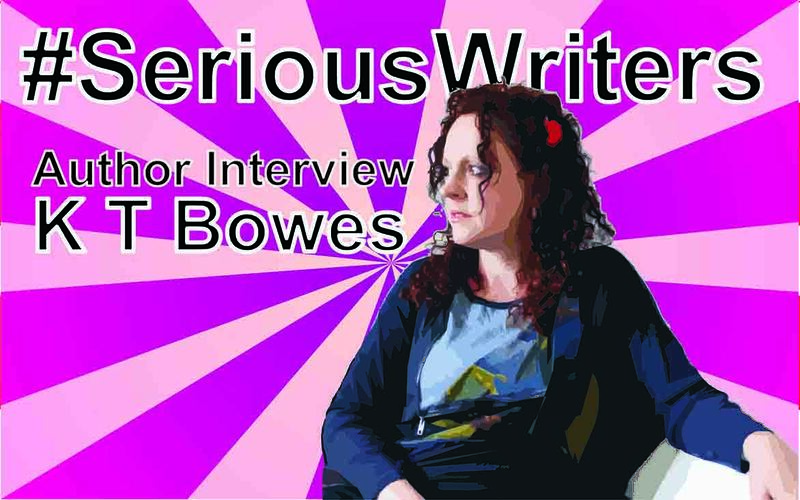 To kick off #SeriousWriters, I invited New Zealand romance author, K T Bowes (Kate), for an interview in which we talk about her approach to writing and advertising her books. Dan: Hi, Kate! Could you start by introducing yourself and telling us a bit about your work? Kate: Hi Dan, thank you for the invitation. I write as K T Bowes and have been publishing for a couple of years. I grew up in the British Forces as an Air Force child, moving around as my father was stationed, spending time in different parts of the UK and West Germany. That gave me a wide variety of experiences and people to write about. My degree in English Literature came from the University of Wales, Aberystwyth where I ironically went to Wales to be taught English by a Scotsman. I’ve done heaps of things in my life, married on impulse, jumped out of an aeroplane and emigrated on a one way ticket with a suitcase and four small children. I view every experience as something to be learned from and unashamedly written about. Dan: What inspired you to pursue a career in writing? Kate: Very few of my career moves utilised my degree, even though I’d had the writing bug forever. When we moved to New Zealand, it was really tough and loneliness and isolation drove me to use the hard times painting and selling my work. When paint and canvas weren’t in the budget, I started writing and the first three books in The Hana Du Rose Mystery Series were born. I worked and wrote on my days off and it helped me to maintain some semblance of sanity. Writing is the best cure for depression I have found. Having other people pay their hard earned cash for your work is the biggest high achievable for a book worm like me. Dan: When it comes to writing a book, do you plan the whole plot in advance or dive right in and hope the story develops? Kate: One thing I’ve learned is that no two authors write in the same way. I’m quite a haphazard writer much to my shame. I wish I could sit down and map out a lovely plan and line up all my research as I know other authors do and I’m full of admiration for them. But unfortunately, many of my plots come as the spark of a thought when I’m running and I invariably make rough notes and then begin as soon as I have time. Sometimes I’ll write more than one novel at a time, switching between them as the scenes come to me. I might write the ending before I’m even half way through or completely change direction as the characters develop. Sometimes I have a fixed idea in my head about who a character is, but they push me in a different direction altogether. That’s how it was with Callister Rhodes in Blaming the Child – I thought she was one thing and she made it quite clear she was another. Dan: What kind of research do you do before writing? Do you travel, interview people, or just use Google? Kate: I use every resource available to me. There’s nothing more frustrating than an author writing something faulty through lack of research. I use Google Streetview, maps, ask people about their work and spend hours getting my facts straight. My father spent over 20 years as a nurse after leaving the Air Force and helps me with medical information. My son was in the army and edits fight scenes and weaponry. I’ve forced my long-suffering husband to drive me around the country taking photographs and visiting places which have little sightseeing value to him. I’ve been to marae and studied Māori history and visited historical sites that I intend to include in my work. I’ve spent nights camping in the bush, despite seriously not enjoying myself, just because I don’t want to be that author who uses the wrong descriptions for something or builds their entire plot on a faulty premise. Dan: What is your writing schedule like? Do you try to hit a certain word count every day? Kate: Until recently, I wouldn’t have had a clue how many words were in one of my novels. It’s not something that’s particularly important to me. I write in chunks and cover off scenes and stop when it’s done. Recently I paced myself against another very accomplished author and was astounded at how much I could write in a very short amount of time. As a general rule I prefer not to count. If I can’t get my head around writing, I edit some of my previous work but I like to have time to sit down and create something new. I have to be in the right frame of mind but I don’t stress if I haven’t written. I’ve stopped making punishing deadlines for myself too. That kind of pressure isn’t helpful for me. Kate: Absolutely! I wrote it, published it and people bought it, liked it and reviewed it well. But as I’ve written more and studied it as a craft, I’ve been able to refine my own work so much. I’ve been back over that original book many times and am probably now reasonably satisfied with it. Dan: Increasingly, writers are collaborating on novels to gain readers. Is this something you would consider? Kate: I haven’t been approached, but I’m not really sure. I’ve heard about it going terribly wrong for some. It’s possibly more of a short story writer type venture and I don’t write short stories as a general rule. Most of mine are over 100,000 words each, apart from the teen books in the Troubled series and a couple of the romances. Dan: Does marketing play a part in your work? If so, what do you do to promote yourself? Kate: I’m on social media. I find that I can interact with readers there and it’s more of a personal interaction than I ever originally expected. I really enjoy blogging in The Library Corner and have some great conversations with readers and other authors. I blog about all sorts of things that interest me there; from my writing to my appalling parenting to snippets about the country I live in. 2 of my novels, About Hana and Free From the Tracks are permafree series starters on Amazon and Smashwords and I’ve had great responses for those. I do run adverts but I’m careful about where I put them. There seem to be a lot of sites out there who are happy to take your money without being able to back up their claims about giving you the success they promise. When I do advertise, it tends to be with a site that other writers have verified as worth it. Kate: Join a really good writing group, such as the Book Review Depot and listen to their advice objectively. Too many people get upset with what they see as criticism when it would have helped them and saved a lot of heartache and wasted time. Never, never post your book link without permission to someone else’s site. It’s viewed as ill-mannered and ugly especially in online communities and is the mark of desperation. It is never the way to get readers. Be really careful what you say online. People can’t detect sarcasm or humour when they can’t see your face and may react badly. Don’t be one of those authors who start disagreements or fuel them. It gets old really quickly and they end up isolated even faster. All of those reasons are not how you want people to remember your pen-name. Kate: Blaming the Child has made it through to the third round of the Authors’ Cave Book Awards, which I’m really pleased about. It’s the third in the Troubled series for teenagers. It’s already received a 5* review from Readers’ Favorite and the Authors’ Cave Seal of Approval so is doing really well. My latest novel is Du Rose Sons, book 7 in The Hana Du Rose Series. I am really enjoying this novel and am taking my time over it. I’m expanding my characters through the plot and there will be some surprises. I’m aware that people are waiting for it but I want it to go out absolutely perfect. K T Bowes is the author of eleven novels including ‘The Hana Du Rose Mysteries’ and the ‘Troubled’ series. All of her books are available on Amazon and Smashwords. Her latest novel, Du Rose Sons, will be released in February 2015. More information about K T Bowes can be found by following all of the links below.